As Grantham noted, if the EMH hypothesis had any validity, four of the largest asset bubbles in the history of mankind would not have occurred just in the past 25 years. Those bubbles are the Japanese stock and real estate bubbles that culminated in 1989 and 1991 respectively, with the Nikkei peaking at over 39,000 and the land underneath the emperor's palace being valued equal to all of the land in California. Then there was the 1999-2000 bubble in stock prices and the bubble in housing and other assets prices that peaked in 2007. The mere fact that most portfolio managers can not beat a market index is not proof of EMH. Instead, their failures only prove that those managers are prone to making a veritable cascade of errors that have a compounding effect and really should not be managing anyone's money including their own. Grantham believes that the path of least resistance, given the abnormal monetary policies of central bankers, will be for stocks to go up in the U.S. "perhaps by 20% to 30% in the next year or, more likely, two years", with the rest of the world, particularly emerging markets going up more to catch up with the U.S. Then, in his opinion, there will be another really nasty mean reversion. As Grantham noted, how rationale was it for investors to price 30 year treasury bonds in 1982 at 15% or as much as 16% when the FED was almost done in squashing inflation? Rational Investors were forecasting inflation at nearly 13% in 1982, thirty years into the future, even though events were then changing to make that forecast totally irrational and unjustifiable. The herd of Rational Investors will invariably project the immediate past into the indefinite future. When managing the bond side of my portfolio, I will not postulate that investors are correctly predicting the future. Instead, I will just assimilate the evidence and formulate alternate scenarios, placing my "bets" based on the probabilities assigned to each scenario. In 2012, I would have assigned a negligible chance to a deflation/persistently low inflation scenario in the U.S. I am now up to 15% to 25%, so I have increased slightly my long term bond allocation. CPI decreased .01% in October on a seasonally adjusted basis. Consumer Price Index Summary Core CPI rose .1%. Other deflationary forces include productivity gains (e.g. automation), abundant and relatively low cost natural gas supplies, anemic demand for products and services and low cost items imported from abroad (e.g. clothing). The demand side of the equation is being impacted by relatively high unemployment, economic uncertainty, generally poor consumer confidence, excessive debt among millions of households, and slightly positive or negative real wage growth. There was nothing surprising in the Fed minutes released last Wednesday. FRB: FOMC Minutes, October 29-30, 2013 The FED will start to taper when it is more comfortable that the economy is on more solid footing. The market initially reacted as if something new had been disclosed on the FED's intentions. Same old mush in my opinion. Bond prices have risen since last Wednesday, with TLT closing at $104.6 yesterday. This bond pays monthly interest at a 2.4% spread to a CPI calculation and matures on 4/10/2018 at $25. Pricing Supplement No. 122 dated March 31, 2006 I explain how that calculation is made in Item # 3 PFK. There were two primary issues that need to be addressed in order to decide whether to take my profit now or to wait. The first is that CPI is currently running below 2% and likely to stay that way for several months at a minimum and possibly for several years. For the 12 months ending in October, CPI increased 1% before seasonal adjustments. Consumer Price Index Summary The second is that the premium to par value will shrink as we move closer to the April 2018 maturity date. The shares are now trading near $26.75. PFK Stock Quote If I wait until maturity, I will lose that premium, worth approximately $168. Another consideration is how PFK is priced in relation to a fixed coupon bond from Prudential maturing at about the same time. I found this Pru bond maturing in August 2018 with a 2.3% coupon trading at over its par value. Bonds Detail The YTM on that one is handing around 2%. In my opinion, the exchange traded PFK is being priced too low if that bond is priced right by the market. If I assume a 3.9% annual coupon for PFK (just a 1.5% average annual CPI for the next 52 months), the YTM at $26.75 is about 2.32%. And, I may have upside up to a 3.31% YTM with my high assumption. Consequently, I have decided to wait for a slightly better price. I currently own 100 shares of IGI. Added 100 IGI at $19.28 (10/14/13 Post) I may elect to sell those IGI shares when and if the share price hits or crosses $20.5. On the ex dividend date, the shares closed at $12.48, down -0.59 (-4.52%) from the previous day's closing price. Adjusted for the dividend, however, the shares actually gained 10 cents. On the day prior to the ex dividend date, the shares closed at $13.07, representing a -14.13% discount to the then current net asset value per share of $15.22. AA is one of my contrarian plays that requires an abundant amount of patience, a commodity normally in short supply here at HQ. GS upgraded Alcoa to buy from neutral and boosted its price target to $11. While acknowledging that the price of aluminum has been sagging, GS argues that the market is undervaluing AA's higher margined products, particularly its engineered products, and I would tend to agree with that assessment. Engineered products includes super alloy castings; forgings and fasteners; aluminum wheels; integrated aluminum structural systems; and architectural extrusions used in the aerospace, automotive, transportation, and industrial products markets. Pages 18-19, Form 10-K; page 9 of ESEC Filed Press Release-Earnings for Q/E 9/30/13. For this segment, after tax operating income (ATOI) was up 22% to $192M with the highest quarter ever of adjusted EBITDA margin of 22.5%. Eventually, there will hopefully be a surge in aluminum prices coinciding with a surge in revenues from those higher margined products. AA has certainly be stuck at historically low price levels for some time now. AA Interactive Chart The stock has made little progress after the Near Depression caused a significant price drop and an ejection from the DJIA. Analysts are not expecting much of a recovery in profits either. The current consensus forecast is for $.31 in 2013 and $.53 in 2014. While that is decent earnings growth, the forward P/E based on that estimate would be about 18.11 at a $9.6 price, which is very high for a cyclical company. AA will need to do far better than that consensus in 2014. Alcoa slashed its quarterly dividend from $.17 per share to $.03 in 2009 and has continued to pay that $.03 per share ever since that slash. Alcoa: Invest: Financial Information: Dividend History I am not anticipating a dividend increase in 2014. So far, I have been patient with this position. 1. Bought 50 KFN PR at $24-Roth IRA (see Disclaimer): The symbol for this equity preferred stock was KFN PR at Vanguard. Security Description: The KKR Financial Holdings LLC Preferred 7.375% Series A Stock (KFN.P) is an equity preferred stock issued by the publicly traded partnership KKR Financial Holdings LLC (KFN). The common stock has a higher dividend yield than this preferred stock. At a total cost per share of $24, the current yield is about 7.68%. KKR has the right to redeem at the $25 par value per share plus accrued dividends on or after 1/15/2018. Distributions are cumulative. There is a Dividend Stopper Clause at page S-19 of the prospectus. KKR can not pay a cash distribution to its common shareholders and defer the preferred share distribution. According to Quantumonline, this security is not rated by Moody's and has a BB rating from S & P.
The last cash distribution was for $.460938 per share payable on 101/5/13. A recent article discussing KKR Financial Holdings was published by Seeking Alpha. Recent Earnings Report: For the 2013 third quarter, KKR reported net income of $33M or $.16 per share, compared to $.39 per share in the previous quarter. Book value per share was reported at $10.42. SEC Filed Earnings Press Release for Q/E 9/30/13 For the nine months ending 9/30/13, KKR reported net income of $224.354. After subtracting preferred share distributions of $20.52M during that nine month period, total income available to the common shareholders was $203.834M or $1.01 per share. The company paid out $.68 per share in dividends to the common shareholders. 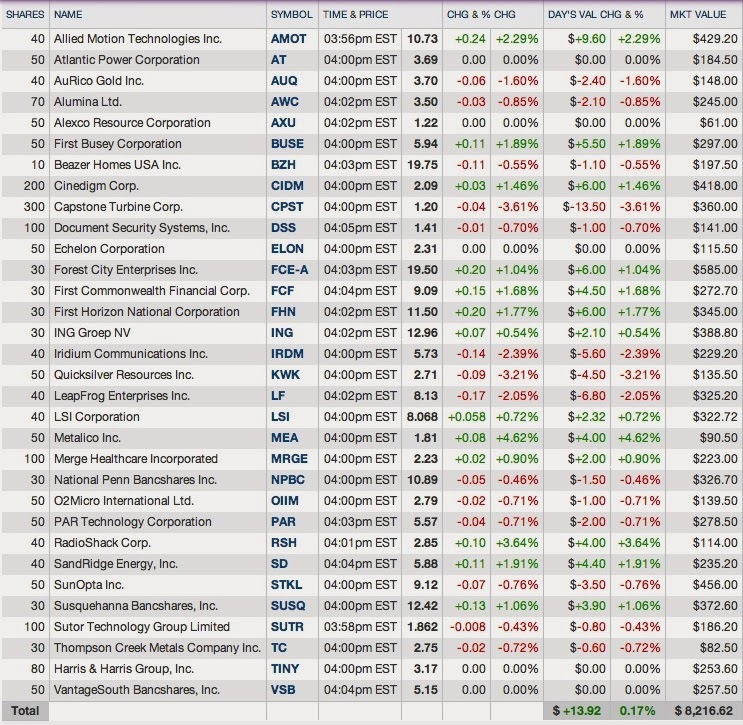 The market reacted negatively to this report, sending the shares down from a $10.87 close on 10/23 to $10.11. KFN Historical Prices The common shares have continued to drift down falling to a $9.42 close on 11/12 (ex dividend of $.22 per share on 11/4/13). YF does not have an interactive chart for the preferred stock, so I have to use the one at Marketwatch which takes longer to load. KFN.P Stock Chart The preferred shares closed at $24.5 on 10/23 and at $24.47 on 10/24, so there was no immediate reaction to the earnings report. The preferred shares continue to rise to a $24.84 closing price (10/30) before declining. The preferred shares traded to a closing high of $26.84 (5/8/13) and hit their low at $23.74 (8/19) before my purchase. I attribute that 11.55% decline to the rise in rates which started in early May. Rationale: (1) Entirely About Generating Tax Free Income in the Roth IRA: The management of the retirement accounts focuses on generating a constant stream of dividends and interest distributions. Cash flow is then used to purchase more of the same, creating a compounding effect over time. A 7.5% average weighted tax free yield for all Roth IRA investments will double the account's value in about 9.58 years, Estimate Compound Interest, and would be generating a 5+% real rate of return based on the inflation forecasts currently embodied in the pricing of the 10, 20 and 30 year TIPs. This assumes that I can managed the income generating securities at break-even. If I can generate at least another 2.5% in realized gains per year, which would bring the annual total return percentage to 10%, then the doubling occurs in 7.2 years. The difficulty is selecting securities that can generate the 10% annualized total return, mostly from distributions, without causing a significant loss in principal value. If I lose most of a $1,000 investment yielding 7.5%, other investments will have to perform substantially better than just an annualized 2.5% gain for me to reach the holy grail of 10% annualized for the account total. I have ceased funding my IRAs. Risks: (1) Lots of Senior Debt: When looking at an equity preferred stock, which is senior only to common stock in the capital structure, it is important to at least look at the amount of debt carried by the firm. As of 9/30/13, KKR had $5.79+B in debt outstanding (page 27, 10-Q). Most of that debt is of the senior secured variety. While I have not performed an analysis, I doubt that the equity preferred stock would have any value in a BK. I would view the credit risk as material. (2) K-1: The owner of these preferred shares will receive a K-1. The distributions will be classified as qualified dividends. I would consequently avoid buying these shares in a taxable account in order to avoid the tax preparation hassle. As noted at page S-13 of the prospectus KKR will have "unrelated business taxable income" (UBTI) which is relevant to my ownership in an IRA. Tax is owed on UBTI that exceeds $1,000 in a retirement account. National Association of Publicly Traded Partnerships This preferred stock will be the only security generating UBTI and I will keep my position at just 50 shares. As noted in that article, it is the "IRA's share of the partnership income and not the cash distributions it receives that is subject to UBIT". (emphasis added). Consequently, it is not really possible to calculate UBIT, with any precision, in advance of receiving the K-1. (3) Interest Rate Risk: As shown by the price action between 5/8 to mid-August, a perpetual equity preferred stock will go down in price when interest rates start to go up. (4) KKR's Long Recitals of Risks: The company summarizes risks relating to this preferred stock starting at page S-8 of the prospectus. The company summarizes risks relating to its operations starting at page 22 of its 2012 Annual Report and ending on page 58. Those are single spaced pages by the way. Future Buys/Sells: Due to the UBIT issue, I am not likely to buy more. I will be looking to harvest a 10% annualized total return when and if the distributions plus capital appreciation provide me with that opportunity. Depending on the price of the common shares, I may sell the preferred shares sooner in order to buy back the higher yielding common shares which have the same UBIT issue as noted in the previously linked posts. 2. 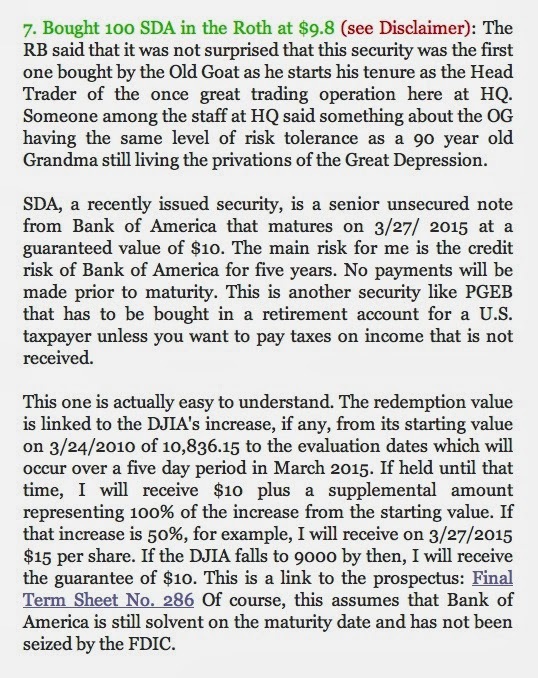 Sold 100 SDA at $14.13 Roth IRA (see Disclaimer): I mentioned that this PPN might be sold when I last updated my Exchange Traded Bond and Preferred Stock Table as of 11/14/13. The reasons for selling it are discussed in my comment to that post. I was satisfied with the 42.31% return since my purchase. The OG is becoming nervous about the stock market. While he may be wrong, he is under the impression that money does not grow on trees and the current level of enthusiasm seems to just about match the pessimism prevailing in March 2009. 3. Added 100 Cominar REIT at C$18.15 (see Disclaimer): This is an average down. I am reluctant to average down when buying securities on the Toronto exchange, using Fidelity, since my commission cost is C$19. I consequently took my full position in Canadian Apartments (200 shares) and Artis (300 shares) in one order. Like other Canadian REITs, this one pays monthly distributions. The current monthly distribution is C$.12 per share. Investor Relations - Distribution History This REIT did not cut its dividend during the Near Depression period, but did maintain the annual rate at C$1.44 for 2009-2012. I recently discussed this REIT and only have a few additional comments. The price has been in a free fall since rates started to move up in early May: CUF-UN.TO Interactive Chart As shown in that chart, the shares closed at C$23.94 on 5/1. The 24.19% decline to C$18.15 is to say the least a significant drop in price. I have not seen anything in the results that would explain that decline. I have bought some of the Canadian REITs for family members using USDs on the U.S. pink sheet exchange. Cominar ordinary shares are listed in the U.S. Grey Market which I try to avoid. I bought shares listed on the Toronto exchange using my Canadian Dollar stash. Recent Earnings Report: For the Q3 2013.pdf, Cominar reported a 14.9% increase in operating revenues; a 14.4% in net operating income; and a 8.1% per unit increase in recurring adjusted funds from operations. As of 9/30/13, the debt ratio was at 50.9% with an interest coverage ratio of 2.81:1. Overall occupancy was at 93.3%. With a lower price, my yield does rise a tad. The yield at a total cost of C$18.15 is about 7.93%, compared to 7.68% at a total cost of C$18.75. As an asset class, REITs have been falling in price and may have further to go. While I believed that most of them were clearly overvalued in May 2013, and consequently did not own any, several have become relatively attractive after declining in price. The 24%+ decline in Cominar shares, which has raised the dividend yield to almost 8%, has reduced the valuation risk. However, once shares decline that much, further declines may happen, as momentum to the downside has a tendency to over compensate. The stock is ex dividend for its monthly distribution on 11/27. Security Description: Banco Santander S.A. ADS (SAN) operates more than 14,000 branches in Europe (including the U.K.), Latin America and the U.S. As of 9/30/13, the bank had 14,561 branches and 102 million customers. At a total cost of $8.62 per share, the forward P.E. is about 12.86. Morgan Stanley initiated coverage of SAN at equal weight on 11/13/13. I have reinvested the generous dividend to buy more shares, starting in July 2012, which have mostly been at prices below this last purchase. The last reinvestment was at a higher price. I am slightly in the hole due to these purchases, however: Bought 50 STD at $13.35 (April 2010) and Bought 50 STD at $12.35 (April 2010). Related Trades: I have bought and sold Santander Finance's equity preferred floater several times and currently own 180 shares: Item # 6 Bought Roth IRA: 50 SANPRB at $19.35 (7/20/13 Post); Bought: STDPRB at $13 (August 2011); Added 50 STDPRB at $15.44 (November 2011). The symbol was changed from STDPRB to SANPRB. Recent Earnings Report: The company reported €1.055B in earnings for the third quarter. Deposits rose 5% to €663B. The President claimed that the bank was now in a position to build profits after years of provisioning for bad loans. NPLs stood at 5.43%. The coverage ratio was 63.9%. Book value was $7.58 per share. Deutsche Bank downgraded the stock to sell after the report. As of 9/30/13, the Basel II capital ratio was 11.56%, up 1.23% in a year. The earnings report is discussed in this Seeking Alpha article. Rationale: (1) Income and Capital Appreciation Potential: I view Santander as a work in progress. Possibly, I may move into profit territory sometime in 2014. At page 12 of the earnings call transcript, the CEO stated that "we don't expect to do any changes" on the dividend which has been €.60 annually. That works out to be a really good dividend yield on the SAN shares. Based on what I read, almost 90% of the total dividend is taken in additional shares. (2) Technicals: One of my many shortcomings as an investor is a lack of any training in technical analysis. I did buy a book on the subject, took it out of the Amazon carton, and placed it on my bookshelf about three years ago. I have not yet opened it. Maybe that lack of knowledge is a positive rather than a negative. Risks: The company summarizes risks in its financial filings (e.g. Form 20-F starting at page 13). The bank's operations in Spain have suffered massive losses, but hopefully that is now largely in the past. Notwithstanding the statement made about the dividend being sustained for another year, SAN will probably have to slash it unless earnings improve significantly. This article published by Seeking Alpha before the last earnings report argues that the current payout can not last. Future Buys/Sells: Depending on subsequent events, I may continue buying SAN shares in small lots. I would want to see substantial progress on the earnings front in 2014, along with significant decreases in the NPL ratio, before committing more funds. 6. Added 50 NBB at $17.76-Main Taxable Account (see Disclaimer): I thought my recent run of bad luck with this security could change by entering a limit order at $17.76. I now own 100 shares of NBB in the main taxable account. The average cost per share is $18.31, down from $18.71. I just changed my distribution option to reinvestment and will maintain that option for as long as the discount to net asset value remains above 5%. Security Description: The Nuveen Build America Bond Fund owns Build America Bonds which are taxable municipal bonds. The fund will terminate on or about 6/30/2020, distributing the fund's asset to its shareholders at that time. The share price closed at $18.61 on 10/31/13, NBB Historical Prices Adjusted for one monthly dividend, the price declined thereafter by 3.94% to hit $17.76. The adjusted net asset value per share declined by .6%. At that rate, the dividend yield would be about 7.84% at a total cost of $17.76 per share. By clicking the "portfolio characteristics" tab at CEFConnect, the investor can see that this fund is weighted in A or better bonds. I acquired this table from the sponsor's website under the tab "holdings & detail". The sponsor shows the effective duration at 10.65 years, and the leveraged adjusted effective duration at 12.41 years, both as of 10/31/13. 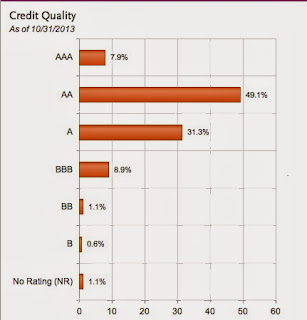 NBB That page also shows the credit quality break-down as of 10/31/13. At that time, the fund owned 101 different bonds. Prior Trades: Prior to this trade, I owned 50 shares in the main taxable account. Item # 2 Added 50 NBB at $18.55 (6/29/13) Other trades are linked in that post. The closing net asset value per share was $20.66 on 6/24/13 (the date of purchase) with the discount then at -9.49%. The discount has expanded by 2.28% as of 11/21/13, and the net asset value has declined by 2.56% unadjusted for the subsequent monthly dividends. Adjusting for 5 dividend payments ($.58) by adding that amount back to the 11/21 NAV, there has been a five cent increase in net asset value per share which is just another way of looking at it (add back $.58 to 11/21/13 NAV of $20.13). Rational: I am generating some cash flow with this purchase and playing the less likely, though possible scenario where long term interest rates remain abnormally low for a far longer period than currently contemplated by investors. The current dividend yield of 7.84% at a total cost of $17.76 is 5.5+% over the average annual CPI forecast embodied in the pricing of the 10 year TIP. Some of the recent discount expansion may be related to year end tax loss selling. This year has been a horrible one for bond CEFs. The up action in 2013 has been in the stock market. Anyone who has bought and held bond CEFs in 2013 is most likely several percentage points in the hole while the S &P 500 pushes toward new highs and a 30% total return for the year. As noted in this recent article published by Vanguard, individual investors are chasing returns, pouring money in stocks over the past few months and jettisoning bonds. Risks: This bond CEF has a number of material risks explained in prior posts. Added 50 NBB at $18.55 (and post linked therein including the ones involving the functionally equivalent CEF NBD) Interest rate risk is huge given the long duration. The high degree of leverage significantly adds to the risks. Risks inherent in owning CEFs have been made clear since May 2013, as the market price has slid more than the decline in net asset value. Credit risk is present, but mitigated by the sheer number of holdings and the credit quality. The liquidation date in June 2020 may turn out to be an advantage or a disadvantage. If rates are about the same or lower than now, then the discount will narrow as that term date approaches and a buyer now would likely receive a profit on their shares. Conversely, if rates are rising at a fast clip, and are much higher than now, the liquidation date could be a disadvantage for a long term holder. There is no way to predict the future but I do know that the discount is over 11% now so that at least provides a cushion in the rising rate scenario. Personally, I would view it as a win to receive 7.84% per annum in monthly dividend payments and then to break-even on the shares in 6 1/2 years. I am not likely to hold onto the shares for that long however. 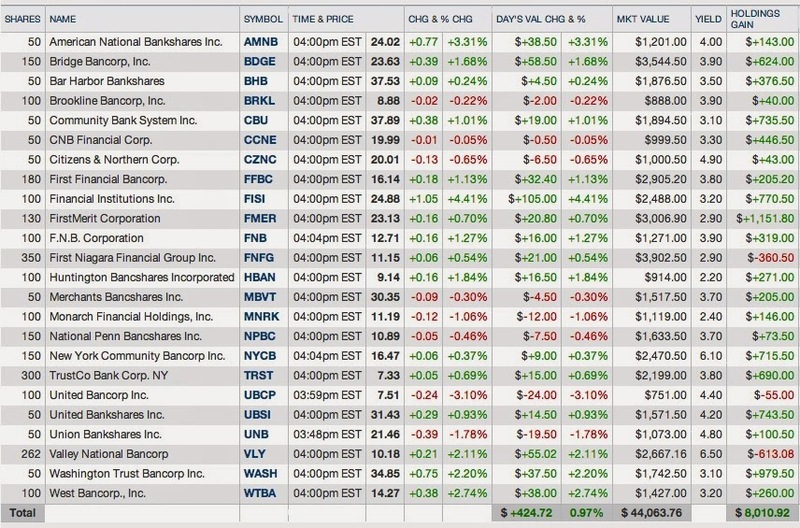 7 Sold 202+ TICC at $10.5 (102+ Roth IRA and 100 Taxable Account)(See Disclaimer): TICC Capital (TICC) is a BDC. By selling the shares for a profit, I realized my goal with any BDC purchased in the ROTH IRA which is a 10+% annualized total return. Total Return 102+ Shares in Roth IRA (Dividends + Share Profit): $255.5 or 25.13%. Rationale: For the ROTH IRA, I am content to receive a BDC's dividend for a year or so and then sell the shares for whatever profit is available. In retrospect, I view the 100 share purchase in the taxable account to be a mistake. Those shares were bought to close to a 5% premium to the then net asset value per share, which violates one of LB's ten billion or so trading rules. LB just said "that it is imperative to maintain both discipline and strict adherence to all RULES!". 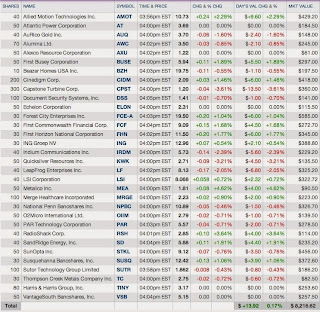 Future Buys/Sells: I will look to buy back up to 100 shares when and if the shares trade below net asset value per share. A 5% premium on $9.9 would be $.495 or a market price of $10.395. This post is long enough. The remaining trades will be discussed in the next post. As previously noted, Google owns Blogger and its software is turning my snapshots dark, making it more difficult to read. The snapshot has a white background until it is uploaded to Blogger. This is a relatively recent flaw in Google's software. AMOT jumped into the lead for the reasons discussed below. CIDM is a new entry into this list and is discussed below. I neglected to include ING in the foregoing list which is up over 40%. I did not find it comforting that institutional investors required this company to pay a 10.75% coupon on a equity preferred stock. C. Bought 50 ELON at $2.23 (see Disclaimer): The purchase of Echelon stock was significantly questionable even for a Lotto purchase. I do not see light at the end of a long tunnel yet. Needless to day, I am not expressing much confidence with a 50 share purchases at $2.23. After my purchase, a cautionary article about ELON was published by Seeking Alpha. Echelon develops, markets and supports products and services involving energy control and savings applications for "smart grid, smart cities, and smart buildings that help customers save on energy usage, reduce outage duration or prevent them from happening entirely, reduce carbon footprint and more". I have no ability to assess the desirability and competitiveness of Elon's products. There are good reasons for these kind of products to exist.. The company has been losing money and the consensus E.P.S. forecast made by 3 analysts predicts (.42) in 2013 and (.34) in 2014. Echelon does have a cash cushion, with cash, cash equivalents and short term investments reported at $59.731M as of 6/30/13, down from $61.855M as of 12/31/12. ELON-2013.06.30-10Q As noted in that report, revenues fell 39.2% in the 2013 third quarter compared to the 2012 third quarter, a far from reassuring development. The company explained that the large decrease was "primarily" due to an overall decrease in large scale deployments in the U.S. and Finland. I looked at the historical results since 2008 that are summarized at page 28 of the 2012 Annual Report. The company has consistently reported losses and revenues have been lumpy. Echelon reported $134+M in 2008 revenues; $103.+M in 2009; $156+M in 2011; and $134+M in 2012. There is a lot of money, as a percentage of revenues, being spent on product development which will hopefully produce a profit in 2015. After I purchased this stock, Echelon reported a third quarter GAAP loss per share of $.08 on revenues of $18M. The adjusted E.P.S. number was ($.06). The company estimates a non-GAAP loss of $.07 to $.12 for the 4th quarter on revenues between $16.5M to $18.5M. Total cash and short term investments was reported at $56.658M. That is a $5.197M decline from 12/31/12. I can not view any of these numbers positively. Echelon will require a lot of patience with at best a highly uncertain prospect for any profit. On the positive side, I can only lose $115 with a total wipe out. I expect no meaningful share price appreciation, without an acquisition offer, over the near term (up to 1 year). D. Bought 100 MRGE at $2.48 (see Disclaimer): Merge Healthcare (MRGE) is in better shape than Echelon in terms of profitability, but MRGE is still easily characterized as a Lotto ticket. The current consensus E.P.S. estimate is $.06 in 2013 and $.2 in 2014. MRGE Analyst Estimates The forward P/E based on the 2014 estimate and a $2.48 price is about 12.4. Price to sales is .95. So Merge has some of the statistical characteristics of a typical LT selection-at the moment. The chart speaks volumes. MRGE Interactive Chart The stock rose from $.75 (11/2000) to $28.72 (11/2005). That works for me, but I would be very satisfied with just a move back to $5. The price has continued to decline after my purchase, one of the unfortunate attributes related to any attempt to catch a falling knife. Then, and this one of the many unfortunate events impacting any long term shareholder, the stock plummeted to $.41 by April 2008; and then worked its way back up to over $6 before succumbing again to two abrupt declines. The last swan dive occurred on 8/9/13 when the stock went from $4.5 to $2.43 after a disappointing earnings report and a CEO resignation. SEC Filed Press Release All of the foregoing is consistent with LT selections. Smashed stock prices are the sine qua non of Lotto selections. There are usually a number of good and sufficient reasons for this classification. As noted in that conference call, part of the problem may be transitory. Hospitals have cut back on spending as they focus on the health care mandate known as ICD-10 - Centers for Medicare & Medicaid Services Hospital spending on Meaningful use and ICD-10 implementation is draining funds from other product purchases. Once those expenditures pass, sometime in 2014, more funds can be devoted to Merge's products and services. A few more quarters, hopefully no more than three, will be uninspiring. There is at least a light flickering at the end of this dark tunnel. I am demoting LeapFrog (LF) from my $500 to $1,000 Flyers Basket Strategy to the Lottery Ticket basket based on a deceleration of earnings growth, the recent lowering of guidance and the increasing competition in electronic tablets catering to children. The stock became attractive again, only as a LOTTO, after management guided down estimates for the current quarter. The stock subsequently did a swan dive making it worthy of consideration under the LT "Falling Knife" approach. LF Interactive Chart As shown in that 1 year chart, the stock hit a closing high of $11.8 on 8/1/13 after quickly moving from a $7.91 close on 4/18. For the 2013 third quarter, LF reported GAAP E.P.S. of $.37 per share, five cents better than the consensus estimate. The company issued downside guidance for 2013 that was well below the then existing consensus of $.62 per share. The new 2013 range is between $.36 to $.46 per share. After this warning, the consensus estimates for both 2013 and 2014 were lowered as analysts revised their forecasts down. As of 11/6/13, the new consensus forecast for 2013 was $.57 and $.65 for 2014 (down from $.73 in 2014 as of 11/4/13). I will just link a few the earnings press release, the transcript of the earnings call and a couple of articles discussing recent developments. A good discussion of LF's current situation can be found in this Reuters article. I would just highlight a few points. LF's management may be unduly pessimistic about Christmas sales. While I do not have a target price, I will certainly consider selling at over $9.5 and will most likely jettison again at over $10. Excluding certain expenses and charges, the company reported adjusted earnings from continuing operations of $.07. GAAP E.P.S. was 4 cents per share. STKL is showing once again its ability to grow revenues while nothing much falls to the bottom line. Third quarter revenues increased 8.4% to $302.7M. In the last analyst, STKL is having the same problem now that it has had for a very long time. It is always a work in progress, moving toward consistent earnings and free cash flow growth, but never making it to the promised land. Consequently, this stock remains a lottery ticket until it can show consistent growth in earnings. Growing revenues is fine provided profits fall to the bottom line. ESIO is a "supplier of laser-based manufacturing solutions for the microtechnology industry". Electro Scientific Industries Profile at Reuters.com; and see pages 4-7, ESI 10-K 3/30/2013. The company is currently paying a $.08 per share quarterly dividend. At a total cost of $9.88, and assuming a continuation of that rate, the dividend yield would be about 3.24%. The stock went ex dividend shortly after my purchase. ESIO was one of those hot Nasdaq stocks during the bubble years, as the stock moved from $7.95 (9/2008) to $63+ (4/2000), split adjusted, and then did the obligatory decline toward sanity, hitting $12.5 by March 2003. Over the past 6 years, the stock has mostly been moving up and down between $10 to $20. I do not pretend to understand ESIO's products, but I do not have to understand for a Lotto purchase. On 11/13, the company reported adjusted E.P.S. of $.14 for the third quarter and $.30 per share for the nine months. Allied Motion Reports Results for the Third Quarter Ended September 30, 2013 On a pro forma basis, which assumed that Globe would have been included in results for the first nine months, the E.P.S. number surged to $.73. EBITDA went from $7.226M without Globe and $22.654M with it. The market reacted favorably to this report. After this report, this stock has turned volatile with typically large bid/ask spreads. On 11/18 for example, the high was $11.94, the low at $10.5 and a close at $10.86. AMOT Historical Prices The spread between the high and the low prices was 13.71%. That would be a good yearly return for stocks on a yearly basis. I. Cinedigm (CIDM): Cinedigm exploded up after announcing its fiscal second quarter results. The company reported a loss for the quarter of $5.256M or 10 cents per share. The results did not include the GVE acquisition. For the next two quarters, which will exclude 3 weeks of GVE's results, CIDM projected revenues of $84 to $86M and adjusted EBITDA of $41 to $42M. The adjusted EBITDA for the Q/E 9/30/13 was $10.636M on $20.367M in revenues. Since my last update, I have had only two transactions. I sold 50 shares of BANC. Sold: 50 BANC at $13.5 (11/12/13). I pared again my position in TRST by selling 50 shares discussed below. A. FNB: F.N.B. announced on 10/28/13 a "comprehensive capital action plan to proactively position F.N.B. for Basel III implementation, including the redemption of certain trust preferred securities, and to support future growth opportunities". As part of that plan, FNB sold 4.1M shares at $12.25 and has granted the underwriters the option to buy up to another 612,244. Another part of the plan will be to issue fixed to floating rate equity preferred stock. F.N.B. priced 4M shares of its series E fixed to floating preferred stock at the initial fixed coupon rate of 7.25% until 2/15/24 and then the security would pay 3 month Libor plus 460 basis points. The over allotment option would allow the underwriters to purchase up to another 600,000 shares. Moody's assigned a Ba3 rating to this equity preferred stock. As with other fixed to floating rate securities recently issued by financial institutions, I would expect the issuer to redeem the security, rather than to pay the floating rate, when it is in its interest to do so. These securities generally permit the issuer to redeem when the fixed coupon period ends which is the case with this one from FNB. I will keep my eye on this one. B. United Bankshares (UBSI): United Bankshares reported net income for the third quarter of $22.2M or $.44 per share, up from $.38 in the 2012 third quarter. C. Bar Harbor (BHB): Bar Harbor Bankshares reported third quarter net income of $3.5M or $.89 per share, up from $.86 in the 2012 third quarter. The estimate, made by one analyst, was for $.83. D. United Bancorp (UBCP): United Bancorp increased its quarterly dividend to 8 cents from 7 cents "based in part on the Company's recent earnings achievements as well as United Bancorp Inc.'s strong capital position". I would just note that the bank cut its dividend from $.14 to $.07 a share back in 2012. United Bancorp, Inc.
UBCP is a micro cap holding company operating through 20 branch offices in Ohio. It has been negatively impacted by net interest margin compression and costs increases due to new banking regulations. E. Valley National (VLY): As shown in the table above, VLY has been a less than optimal selection. 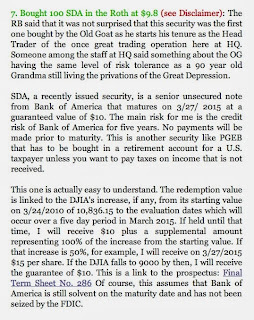 I have an unrealized loss in the position that has been offset some by the generous dividend. I have noted in prior posts that the earnings at VLY have stagnated, and the dividend payout ratio was near 100%, two good reasons for a dividend cut. For the Q/E 9/30/13, the bank reported earnings of $.14 per share, lower than the dividend per share paid during that quarter. Valley National Bancorp slashed its quarterly dividend from $.1625 to $.11 per share, a 32.3% decline. While the bank noted that it did not cut the dividend during the Near Depression, that is true for most of the banks owned in my regional bank basket since I started that basket strategy in 2009. I view the dividend cut as prudent given VLY's recent earning's history and reasonably forecasted earnings for the next year or two. At a $9.75 price, the dividend yield at a $.44 per share annual rate would be about 4.5%. I am keeping my position based on several favorable attributes including the bank's okay capital position (page 86 Form 10-Q), a return on tangible equity of greater than 10%, a low NPL ratio at 1.02% and charge off ratio of .33% annualized (both as of 9/30/2013) and geographic location and number of branches in its geographic service area (205). A more upbeat article about VLY can be found in this Seeking Alpha article. Even after that dividend cut, the payout ratio is still high at around 76%. F. Sold Highest Cost TRST Shares at $7.29 (see Disclaimer): Admittedly, I play small ball as an investor. 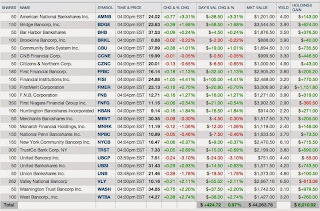 There was one more purchase of 50 shares at $5.65 back in May 2011. If and when the share price crosses $7.75, I may dispose of those shares which will reduce my average cost further. I am no longer reinvesting the dividends based on the current share price being viewed as high relative to earnings. Rationale: TRST is becoming expensive based on the TTM P/E, TRST Key Statistics, as well as on the 2014 consensus estimate for 2014 which is $.45 per share. At $7.29, the forward P/E is 16.2. I start to become uncomfortable when these small and slow growing regional banks are trading at a 15 or higher forward multiple. I have now managed the position down to my lowest cost shares purchased in the open market ($4.01, $5.1, and $5.17), which is part of my "small ball" trading strategy. Based on the current dividend, and at a total cost of $5.16, my current dividend yield is 5.09%.